Robin’s rants, Henry plans Arsenal return, Ozil is up for grabs now! Just what we need to hear from one of Arsenal fans favourites. Robin says it’s time to get tough and get in the faces of the opposition. We need to do unto others what they so love to do to us. Play the pretty football, yes, but when the chips are down, put the pretty stuff on the back burner and start showing some grit and steel. Frimpong certainly wasn’t afraid to against Barnet was he, now the rest of our crop need to adopt a similar stance. One difference though between playing Barnet and teams like the Chavs is that the Barnet players don’t roll over like they’ve been caught by a stray bullet from the local firing range. Football for them is hard week in week out, they ride a tough tackle and dish out tough tackles, it’s called football. and we need to start mixing a bit of that in with our pretty stuff! Shall we dance Emmanuel? Nah Audrey, let’s go get stuck in!! During an interview Robin said this about Holland and Arsenal. Funny enough he was the first player that Howard Webb booked during the WC Final. Just before France had to pack their bags, Patrick Vieira said to me that you don’t have to play well in the group stages of a World Cup, not even in the second round.Only later do you have to grow as a team and you will reach a high level. That will get you to the final. That is exactly the way we did it. Against Brazil in the second half, we were brilliant. Van Persie added that five trophyless years at Arsenal are proof that great football does not always get its just deserts. I know how difficult it can be to play wonderful football and not get the result you want, I see it at Arsenal more than I want to. When we play the likes of Bolton and Blackburn we dominate the game, we play attacking football and they score from a lousy throw-in or an odd corner-kick. Then we end up chasing them again. The criticism Holland got in the World Cup I recognise from what we get at Arsenal. It was a final. You don’t give up without a fight, do you? Good man Robin, now tell your team-mates and your boss! Thierry Henry has spoken about his move to the USA, it’s a short-term plan, he wants to win another trophy, then retire and come home to England and be part of Arsenal again – it wouldn’t surprise me one bit if he gets his coaching badge while in the States and is being lined up to be part of our management team, maybe with Dennis Bergkamp…. Now that’s a mouth-watering prospect!! Mesut Ozil is up for grabs after Werder Bremen admitted they will listen to offers for the midfielder, I’m not sure whether we would be in for a shout of getting him as his value is around £20M. If ever though a signing could happen to put the smiles back on the faces of Arsenal fans, it would be this one. We could always offer Werder Bremen Diaby, Denilson and Almunia in a player swap deal couldn’t we?? Finally, well done to Tom Cruise whose goal helped England under 19’s beat Austria 3-2 and Francis Coquelin played his part in a France 4-1 over Holland. Gilles Sunu was on the bench. Interestingly, there was the next Sneijder generation on show in the second half. If Wenger is after another youth player, maybe he should be looking to snare him Rodney Sneijder is his name, keep an eye out, his current club is Ajax! It all begins just how it ended!! Well shiver me old timbers, the new season kicks off today and I’m really disappointed that both Almunia and Fabianski are the two goal keepers travelling to Barnet! I think I speak for every fan here when I say I’d much rather seen Chesney and Mannone in the twenty-two man squad…. What can be made of that, is it last chance saloon for both Almunia and Fabianski? Is it their own sudden death penalty shootout to see who stays with us next season as number 2, or is it going to be same old fight between the two of them to play each week?? There have been plenty of rumours surrounding Arsenal and goal keepers which is a good sign, so we could still see a new No1 this coming season. I sure as heck don’t want us to start the new season with either of those muppets in goal!! The Daily Express have picked up on the Handanovic reports, as have Wikipedia. The latter suggest he is due to sign after a medical. Still just 25, the Udinese No1 is Slovenia’s undisputed first-choice keeper. That status has been earned over several years, but most notably during a South Africa 2010 qualifying campaign that witnessed Handanovic marshal, arguably, the meanest defence in the entire European Zone. He conceded just three goals in eight group matches, which included an all-important clean sheet in a decisive victory over Russia. Did he impress enough at the World Cup to convince you that he is better than what we have already?? Could this man be our next new signing?? On to today, here’s the squad in full for the Barnet game..
I’ve paid my £3, and I really hope I and all fans get to see the two new boys and the likes of Lansbury, Nordtveit, Wilshere, Frimpong and Djourou play – I still believe they have a role to perform this coming season, especially if the cheque book stays closed…. Finally, Arsene Wenger needs to step up in his chase for a new defender but we all know that. Now though it seems that Vidic is desperate to leave Manchester United and move to Real Madrid. Should that move take place, you can bet your bottom dollar and rumour is we have a few, that Fergie won’t hang around in the transfer market to find his replacement. So come on Arsene, if you really want Gary Cahill or Phil Jagielka, best you get on with it! Arsene out – ‘Jogi’ in? Mancs spend again, we don’t, yet…..
Firstly, before anyone even thinks that I am suggesting that Arsene Wenger be sacked, I’M NOT!! Joachim “Jogi” Löw – how many of us raved about the way Germany played? How many of us thought he used his substitutes at just the right time? Funny enough, Jogi’s contract with Germany has expired according to Sky Sport, so maybe its time for the Arsenal Board to find out exactly what Wengers intentions are. If there is a hint of him leaving Arsenal, would it not be a good idea to go and head hunt this manager and secure his signature now, ready to take over when Wenger leaves??? Joachim “Jogi” Löw is clearly a believer in the style of football we currently and I reckon he could be the perfect replacement for our current boss. He’s an ex attacking midfield player from the German League who then went into club management following retirement. He managed clubs that don’t jump out at you but Germany didn’t take long to get him involved in their national set up, so he must have been pretty good in their eyes. In fact Löw surprisingly became assistant coach of Germany under Jürgen Klinsmann on 1 August 2004. Klinsmann and Löw had known each other for years, having met at a coaching school – When Klinsmann was appointed as the German manager, the first thing he did was call up Löw to work by his side. Klinsmann saw Löw as a ‘talented tactician and wanted him to bring in his fresh ideas. Klinsmann and Löw formed a formidable team and got Germany back to winning ways, they reached the semi-final of the Confederations Cup before losing to Brazil 3–2 in the best match of the tournament. Germany then defeated Portugal 3-1 in the third place match. In 2006, Klinsmann stood down and Löw took over the managers position. This last World Cup showed us what a good manager he is, could he cut it at a top club like ours? Would life be as easy without having the players he currently has at his disposal?? Under Jogi, Germany have lost only 9 times in 55 Games, not bad, eh? As long as Jogi changed a few habits and stopped picking his whatnot, I wouldn’t be too disappointed if he were our manager one day, would you?? Of course, my first choice would be that Arsene Wenger stay and see his Youth Project bare great fruit…. Talking of Youth Project, The Mirror reports that we are in a battle with the Spuds for Connor Wickham. He would cost around £8M which is a lot for a seventeen year old striker, but as he’s English, what do we expect. Knowing Wenger, this rumour could be true, Theo Walcott is a good example of him paying big money for an Englishman. Citeh have added another player to their squad, so best Arsene get a move on in the transfer market, it’s going to be a whole different Premier League next season and we don’t want to fall behind early…. What a plonker and Should Wenger stick, twist or juggle? Yesterday the news broke that Thierry Henry has left Barcelona to head for USA, having signed for New York Red Bulls. What a plonker, why would a player like him go off to a country where ‘soccer’ is way down the pecking order of sports?? He’s only 32 years old and still has two or three seasons left at the top, shame he didn’t give Arsene a call and ask to come back home. Arsenal is his home, it always will be, just think how he could have helped Theo, Chamakh and all the young strikers. I’m sure he would have taken a pay cut to come back :)Money has to be the reason he’s gone to the States, not that he probably needs it but why would a player of his stature go and play there otherwise? Surely he would have been better off coming home or returning to France? But hang on, why would he go to France right now, hasn’t the French Footballing nation taken it upon themselves to blame his handball against the Irish, for their dismal performance in South Africa. Anyway, as far as i’m concerned, England and Arsenal are is home and why move further away from his only child..
On to Wenger…. Should he stick with his own principles, or start to juggle a few with experience?? KTR7 has this view on life under Arsene Wenger…..
What Arsene Wenger is doing will one day be remembered along with Lobanovsky’s Kyiv of 70s, the great side Ajax of 70′s, Sacchi’s Milan, SAF’s ‘kids’ and Barcelona 2008 – present day. What Wenger has to juggle with is to fill the final piece of the puzzle which is to buy or not to buy. We reproach him when he says that buying the Alonso’s of this world will kill Denilsong or Diaby, to us it’s absolutely ridiculous because who wouldn’t want Alonso? Hang on though, what if we buy Alonso and let Diaby go, he then goes on to become a world beater only for us to go after him later. 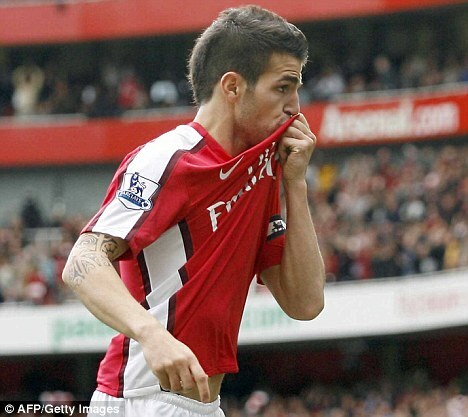 By then he’s valued at 80mil – we won’t want to pay but do we resort to say he has London Colney DNA? Barcelona traded Cesc for Silvinho, but right now they are regretting it. I’m not for one minute saying that Denilsong or Diaby will win golden balls but it’s good to view a situation from all angles. Barcelona has bought David Villa…yay! But it diminishes Bojan’s chances. If he leaves for a major European club and develops to a balon’dor contestant what will Barcelona do? Was it worth enjoying 3-4 seasons of David Villa over a decade of Bojan? Arsene Wenger’s job is difficult as it is – a bit like juggling a small blanket on a cold night. If you cover your feet the head feels cold and vice-versa. Wenger may or may not find the optimum point but he will for sure will leave a legacy. Who knows maybe the Emirates will be known as the Wenger arena in years to come just like Santiago Bernabeu for Madrid? You are currently browsing the Avenell Road blog archives for July, 2010.